Tamdhu distillery is a single malt Scotch Speyside whisky distillery, located in the town of Knockando in Banffshire, Scotland. Tamdhu comes from Gaelic for little dark. Visits by arrangement. Built in the 1890s to some very advanced specifications, the distillery operated between 1897 until 2011 when it was closed. 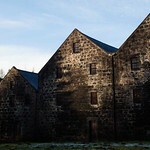 Happily, in 2012 it was bought by new owners with the single intention of creating a high quality speyside whisky. It is early days obviously, but they are already winning awards. BTW you already purchase 10 year single malts - see website below. Contact them to persuade them to let you visit.